Users who have subscribed for various categories are Category Subscribers. 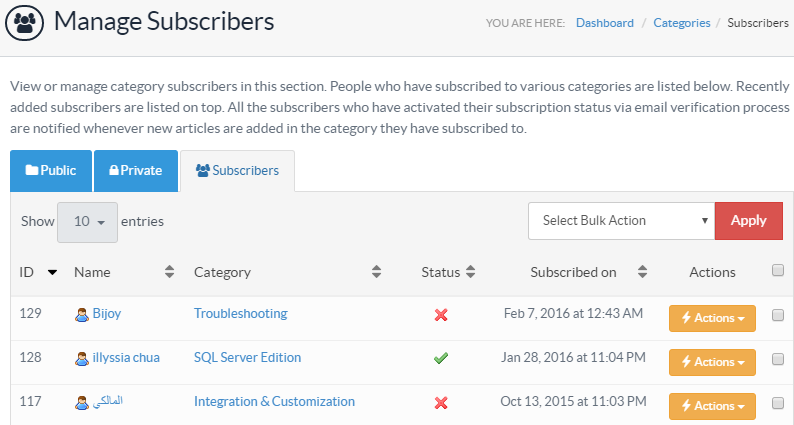 Superusers can view and manage these subscribers from admin section. Expand "Categories" section under left navigation bar and click on "Subscribers" link to open Manage Subscribers page. Language drop-down is available on right side of the page from where you can select a language to manage the subscribers of the language selected. This feature is available only in multi-language (ML) editions of software, not in non-ML editions. ID: This column displays the auto generated serial ID of the subscriber in the database. Name: This column displays name of the user who has subscribed to category. Category: This column defines the name of category for which user has subscribed. Click on the category name to view its details. Status: If active, the subscriber will be notified of articles posted under the subscribed category, vice-a-versa for inactive. The crossed icon shows the inactive status of a subscriber and a tick icon shows active status. Subscribed On: This column displays the date and time on which the user has subscribed to the respective category. Edit - Click to edit the details of the subscriber. 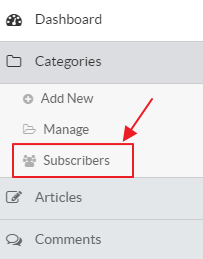 When you click this option, Edit Subscriber page will be displayed as shown below: You can edit Name, email address and subscription status of Subscriber can be modified through this screen. Delete - Click to delete the subscriber from the knowledge base. You can perform the same action on more than one subscriber simultaneously through "Select Bulk Action". For this, you first need to check the check boxes corresponding to the subscriber for which operation is required, then select the required action from the bulk action drop-down and click on "Apply" button.